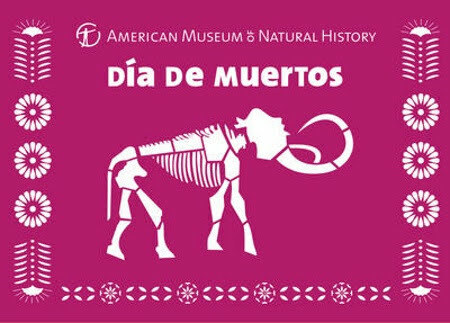 Immerse yourself in the traditions of Día de Muertos during a family-friendly, full-day festival at the American Museum of Natural History, which will feature altars dedicated to extinct animal species, performances by Mexican folk musicians and dance troupes, hands-on artisanal and scientific workshops, and a craft marketplace. The AMNH "Día de Muertos Day of the Dead" Festival will happen on Saturday, November 3, from 11 am to 5pm. The Museum is celebrating five extinct species as a way to honor the lives of those animals who were once members of our vast biodiverse family on Earth. Traditionally, Día de Muertos is a day to celebrate the lives of members of our family and community who have died. The Ballet Follorico Mexicano de Nueva York will be performing traditional music and dance from the festival of Guelaguetza that takes place in Oaxaca every year. Representative of specific groups, these colorful and festive choreographies are a celebration of indigenous identity. A chance to design your own Día de Muertos mask, mini-altars, and other takeaways. The legendary artform of papel picado, cutting imagery into colorful paper banners. Enrique Olvera of Cosme and Atla will present the tradition of pan de metro, highlighting the methods of manufacturing, the messages behind the intricate designs, and giving visitors a chance to taste the authentic recipe of this traditional dessert. The Center for Biodiversity and Conservation integrates the Museum’s science, collections, and technology to combat real-world conservation problems and solutions. Meet conservation scientists and learn how they – and you – can work to protecting our planet’s biodiversity. Expert artisanal chef Celia Florían presents ingredients endemic to Oaxaca, and insight into the state’s rich flavorful history. Discover intricate Oaxacan weaving, passed on from generation to generation, with la maestra Elsa Abigail Mendoza. Over 30 artisans from Mexico and the U.S. present their wares at this all-day Mexican Marketplace.